Managed print services save both time and money. For small business and enterprises alike, the ability to use accurate print usage analytics while freeing up IT resources drives sustainable growth. However, managed print services need to be highly customized in order to generate value. Every aspect of the service needs to be streamlined to fit your particular workflow and print volume. When appropriately implemented, this custom approach to managed print services can result in reduced IT operating costs of up to 30%. Many factors play into this figure, including opportunities for print efficiency and the opportunity cost of automating high-volume, low-impact print processes. But one of the most important factors that office managers and executives need to keep in mind is pricing. 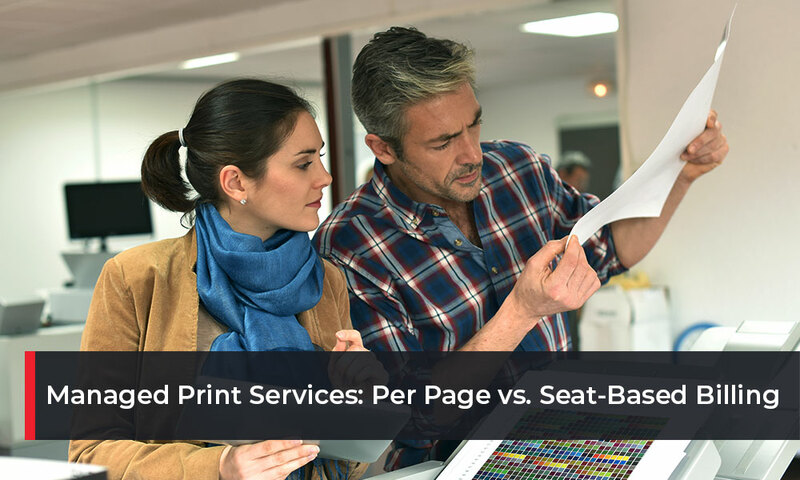 Managed print services come in two broad flavors when it comes to payment – you may either pay a fixed rate per-page or pay according to a fixed seat-based billing arrangement. • Per-Page Billing. Under a per-page billing agreement, your organization pays a specific rate for every page it prints. In a typical scenario, your managed print service provider might charge a specific rate for every monochrome document it prints, and a higher rate for every color document it prints. Sometimes, providers will specify minimum and maximum values, and then charge differently for values under or above those values. • Seat-Based Billing. Seat-based billing charges managed print customers by the number of users they have. This means that your managed print services provider will charge you a monthly fee based on how many employees use their print equipment. Each of these options comes with its own sets of benefits and drawbacks. A comprehensive print audit can help you project print usage to determine which one will work for your office best. Per-page billing is by far the most common billing arrangement for managed print services in New Mexico and the rest of the Southwest. While the system makes sense on the surface, it can lead to an uneasy conflict on interests between the customer and the service provider. The problem is that American print volume is generally remaining flat or going down over time. In fact, many clients choose managed print services explicitly because they want to better organize their print assets and manage out-of-control printing to reduce costs. But if you pay your managed print provider for every page you print, your print provider has no incentive to help you reduce print volume. In fact, it has a clear incentive to encourage you to print as much as possible. As a result, per-page billing generally only makes sense in the context of larger managed service agreements that include document management and network services. This generally makes it the preferred payment method for large enterprises with printing responsibilities attenuated by more robust document management infrastructure. Smaller organizations will generally gravitate towards seat-based billing. Under a seat-based billing arrangement, your managed service provider has a financial incentive to help you print as little as possible, and to help you grow as much as possible. While overall printing trends point towards reduced print volumes in most American industries, it’s a fact that growing companies will add more employees as they expand. As a result, your managed print service provider will earn more by helping your company grow, and try to reduce its own costs as much as possible by reducing print waste and improving document efficiency. While it’s great for small, growing businesses, seat-based billing can become problematic for large enterprises. If the majority of employees in a large enterprise department don’t use print resources regularly, then you may essentially be paying for services you don’t need, at the individual user level. In both the per-page and set-based billing cases, print governance software and transparent data analysis are keys to achieving sustainable value through managed print services. Investing in a comprehensive print audit can help you identify where your print volume is headed in the short term, and which billing structure will offer the greatest value in the long term. Monitoring your print usage and implementing modern predictive analytics tools will help you make the best choice for your organization. Rely on reputable imaging expertise to enjoy a smooth transition to the world of managed print. DSI can help you find the most efficient billing solution for your managed print services. Ask one of our experts about our options!